Fantasy Chess Combat - Don't just automatically take that square - FIGHT FOR IT! and you can bludgeon a King to death! 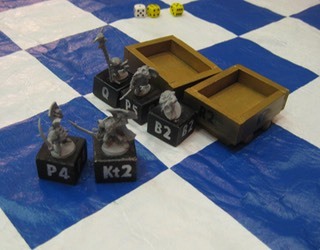 Fantasy Chess is a blend of Traditional Chess and miniatures or role-playing game mechanics where you can co-occupy squares and use dice to determine capture outcomes. Orc Queen and retinue assault two Dwarven Castles. Any age can cheer the bludgeoning of a King. When was the last time you heard a chess player cheer their capture? If you have ever wanted to move beyond Traditional Chess because there was no more excitement to it or because the conflict seemed too extrapolated from its battle roots, come experience this combat oriented chess game. Cheer the bludgeoning of the King! A variation on the theme of chess, where you move and check the same as traditional chess, but you may move through your own ranks, carry pieces, fight for squares (with dice and statistic sheet) and MORE! 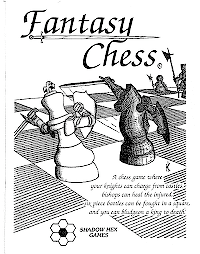 The Fantasy Chess project was simple. Combine chess with wargaming. Make a chess game that you had to fight for the square. As the evolution of Fantasy Chess progressed, playtesters liked and didn't like many things about the game and it evolved slowly from its rudimentary state. But one thing remained constant: This was a variation on a theme of chess. It should not mutate into something that does not act or look like chess. It should use the standard chess pieces (regardless of what they look like) and use the standard chess moves in its core game. Let the expansion sets take on the outrageousness some of the playtesters demanded. Aside from Expansion Sets to Fantasy Chess, Shadow Hex Games is developing Zombie Chess, an apocalyptic look at traditional chess. You can e-mail the link below with any questions about how Fantasy Chess or Zombie Chess operates, where to get Fantasy Chess/Zombie Chess Rulebook or any other questions. I made Fantasy Chess to be an interesting variant on chess. 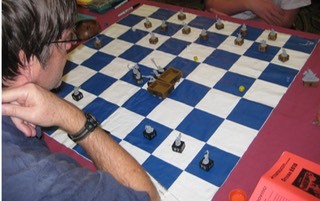 It is traditional chess with a layer of wargaming (or Role-Playing Game) mechanics layered on top. It uses traditional pieces (Pawn, Rook, Knight, Bishop, Queen, King) with their traditional moves. What makes it different is the ability of pieces to share the squares and instead of taking a piece, you fight for the square using dice and statistics. Six different pieces with six different moves. A playing surface of 8 squares by 8 squares. Move your pieces in such a way as to be able to get one to enter the enemy kings square, thus winning the game while avoiding his pieces from getting at your king. Remove those enemy pieces that get in your way. Children have been taught to play traditional chess and its easy for them. If you remove the daunting thought that traditional chess is hard because there are so many ways the pieces can interact, that if I make the wrong it'll be over so I have to worry over this move for 10 minutes, that its an intellectual bully game, you are on your way to having fun with Traditional Chess. Well, that is what Fantasy Chess is doing. Its having fun with Traditional Chess by adding some flavor to it. In the core game, all it does is add the ability to co-occupy the square of your own troops. It does replace the taking of pieces with a dice procedure that notes hit points and each piece's ability to hit, but once you learn the combat system (a common concept for most miniature games and role-playing games), it isn't really that complicated. 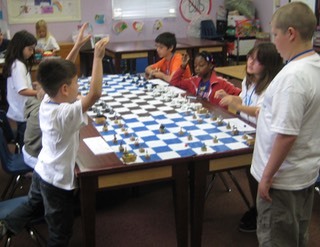 Children have been taught to play Fantasy Chess and its easy for them. Having playtested Fantasy Chess over the years with hundreds of players, I know I have a playable, exciting chess variant. If you give it a try, I think you will agree. Shadow Hex Games is located in Portland, Maine.